Clutter can make a home less desirable to buyers, but all too often home sellers are reluctant to let go of their possessions before relocating. There are many reasons why a home seller may want to avoid decluttering before moving. Sometimes this happens when a seller plans to buy a larger house and will need possessions to fill the new property. Other times the seller may feel that they don’t have time to sort through their belongings before leaving. Some sellers have an emotional attachment that makes it hard to let go. Still, removing clutter from the home during the selling process is important. At times like this, self storage can be very helpful. Clutter creates many problems. To begin with, clutter can make a home look small, dark and cramped. Clutter like bills, knick-knacks and magazines create a lot of visual chaos that can detract from the beauty or the interior design of a home. 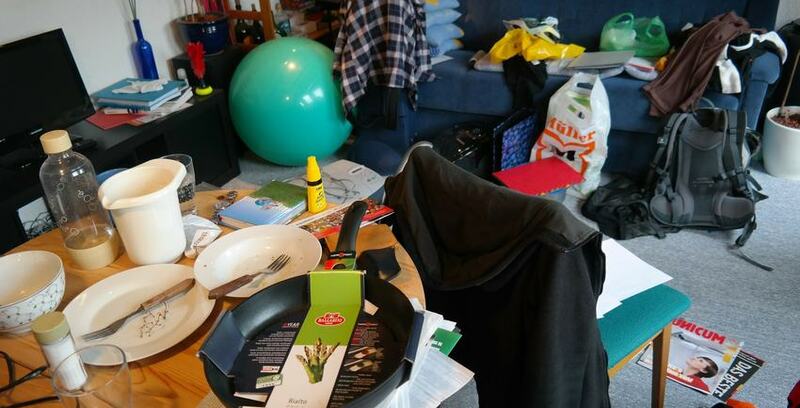 This type of clutter is often hard to clean and can cause the home to become dusty. Clutter also makes the storage space in the home look smaller. By obscuring the dimensions of the closets, garage, storage shed, attic or basement, clutter can give the appearance that the storage space in the home is just not large enough to hold the homeowner’s possessions. This can be a downside for home buyers, who often favor homes with ample storage space. Renting a nearby self storage unit makes it possible for homeowners to remove the clutter from their home without selling it or throwing it away. Self storage makes it possible to hide the clutter in a space outside the home. For sellers who are in the middle of packing, a self storage unit provides a place to hide moving boxes that may detract from any potential home staging. Homeowners looking for the best self-storage unit for their money must look for many features. Cleanliness is important. Cleanliness can help keep away pests like mice and bugs. Since mice and insects can do damage to boxes and the items inside the boxes, a pest-free environment is important. Security is also an important feature in a storage unit. Security helps ensure that the items being stored are safe, and that the people who come to drop off items in their storage unit are also safe. While taking a tour of the storage facility, homeowners should note whether or not the site is well-lit and whether or not the entrance to the storage unit is secure. It’s also helpful to ask the manager of the self storage facility whether or not security cameras are on the premises to keep the storage unit secure. Finally, a person hoping to rent self storage space should look for indications of good maintenance overall. Warning signs like peeling paint, broken elevators and burned out light bulbs could be an indication that a self storage facility is not well maintained. If you’re a homeowner hoping to sell your property, now is the time to take control of your clutter. Contact Lockaway Storage, the self storage solution in San Antonio. Check out our reasonable rates and positive reviews!